Last week I announced that I would be starting a 'Foodie Friday' section on my blog and as promised, even if it is a day later here is my first Foodie Friday entry. I have always loved cooking and from a very young age my mother and grandma taught me how to cook. In fact, I'm often surprised by the amount of women my age who cannot put together a few simple ingredients. Cooking has always been important in my family and despite having the odd cheat days, I have grown up with a rather healthy diet. It was when I started college the weight dramatically appeared. Fast food felt more convenient and I was always tempted by chocolate on the way home. Two years later I decided to go on a diet that would evitably changed my life, but also made aware of what I should be eating to stay healthy. I began cooking again, exploring new ingredients and decided to vary my diet a little bit more so that I'm getting most of the food groups I can. Being vegetarian I'm often asked 'what do you eat?' My answer is usually 'a lot more than you think I can.' My husband always tells me I have such a varied diet and even he is shocked by the amount of amazing vegetarian meals out there. In fact, he eats a lot more vegetarian meals than before he met me. Last week I came across this recipe for a Butternut and Chickpea Curry and thought I'd have a go a t making it. It was surprisingly really quick and easy to make and tasted so yummy. The recipe is low fat, vegetarian and has a lot of hearty ingredients making you fuller for longer. When I posted this image of my Instagram and Facebook page I had a lot of people asking me to how to make it. I then thought it would make a great introductory post to my Foodie Friday's and I thought I would share the recipe with you. 1. Spray a large pan with sunflower oil and cook the onion, ginger and squash for 5 minutes until the onion is tender. 2. Add the tomatoes, chick peas and curry paste and simmer gently for 15 minutes until the squash is tender. 3. Add the spinach and simmer for a further 5 minutes and turn in a large serving bowl. 4. Stir together the cucumber, red onion, yogurt, mint and cumin seeds. Add a squeeze of lemon juice to taste, then spoon into a serving bowl. 5. 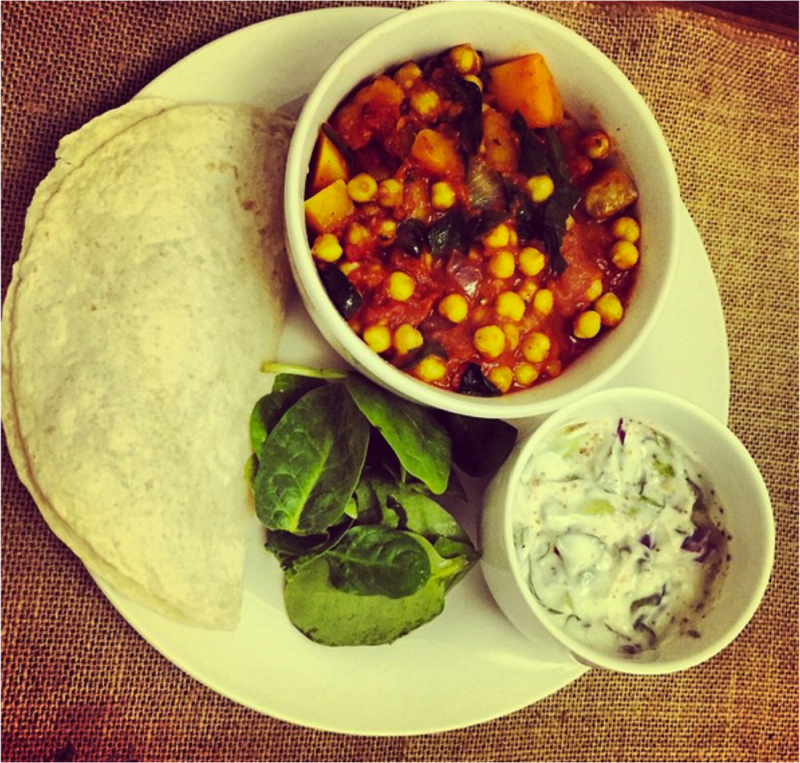 Warm the tortilla wraps or chapattis according to the packet instructions and serve with the curry and yogurt salad. This is one of the best meals I have cooked in a while and I really urge you to try it for yourself. Have you been doing any cooking lately? *This post is not sponsored, I just really like the recipe. This looks delicious, will definitely have to give it a try.